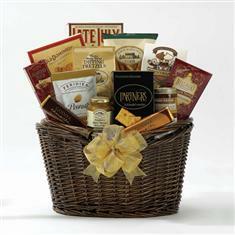 Our Kosher Delightful Gourmet Basket gift is filled with 3 pounds of sweet gourmet foods that are suitable for sharing for all occasions. Includes; peanut brittle, Feridies, salted peanuts, Brown & Haley Almond Roca, East Shore honey wheat dipping pretzels, Robert Rothschild Farms raspberry honey mustard and cinnamon honey graham pretzels, Brent & Sam's chocolate chip cookies, Bellagio chocolate truffle drink mix, antipasto spread, Partner's toasted sesame crackers and two Godiva chocolate bars. All packed in a reusable wicker basket.